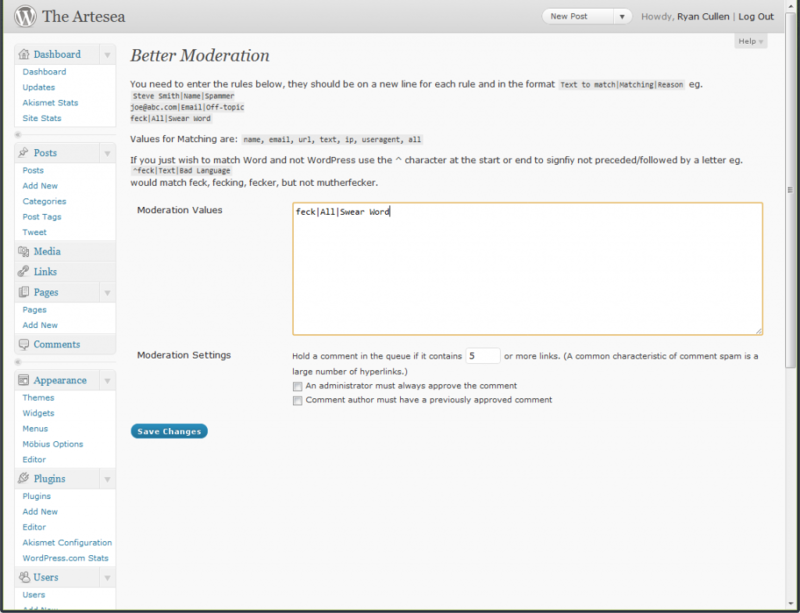 My latest wordpress plugin is called Better Moderation and was built to be used on LibDemVoice, but is available for all. One of the biggest problems we have is that people like to leave rude messages, under the current system in WordPress you can add their IP address, email or name to the moderation list and in future their comments no longer automatically appear. You might even find some keywords they like using and you can add these to the list. The problem occurs when you login to see what comments are awaiting moderation. You look at the list and there is a new comment, but why has it been moderated? Maybe a swear word, in the past you added them to be blocked, one of the other admins manually moved them to the moderation queue, might just be too many links, or a collection of these rules. So you approve the message, it appears on-topic, but the reason was that someone else in the team had decided that this person was no longer welcome. This is why I first hacked the core of WordPress (a really bad thing to do as you can no longer run the automatic updates), and then carefully created a plugin to do it properly. So instead of second guessing why a comment has been moderated a new “Moderation” column is displayed, and via the Better Moderation settings page you can add reasons to the moderation list providing you with an answer to why. and they are separated by the pipe | (on a UK computer this is the key in the bottom left and needs shift held down). I’ve also added an additional rule. In the default moderation adding word would also match WordPress, but in Better Moderation if you use word^ it ignores any word which has letters after it, so WordPress would be acceptable, whilst Crossword (starts with other letters, but doesn’t end with any) and word-count (punctuation) would be caught in moderation. If you only wanted to match exactly “word” you can place the ^ at both the start and end ^word^. Any questions leave them in the comments below, any donations can be made here and you can download it here http://wordpress.org/extend/plugins/better-moderation/. Does this plugin work along with the built in WordPress moderation or does it act as a replacement? In other words, will I need to move my current list to this plugins box? This plugin adapts the current moderation system. It should pull in your old list, but you will need to add the annotations yourself afterwards. Hello Ryan. Thanks for the reply. I activated the plugin, yet it did not pull any data from my current WordPress moderation list to the plugins list. So will the words in my current WordPress moderation list still work or does your plugin override them and require me to put them in your plugin’s moderation box? I can add the additional annotations with no problem, in fact I could just as easily copy and paste the old into your plugin’s box. But my question is, does your plugin override the ones I already have set up with WordPress? And does this affect my Blacklist? Warning Better Moderation installed, some settings may be overridden. Could you please explain which settings are overridden? Off the top of my head Copy and Paste what’s already in the previous list, I’m pretty sure it over rides the main settings, but Blacklist should be ok. Once the holidays are over I can take a deeper look at the code to confirm. Does this work on multi-word phrases? Yes it does that, if you try to post here now with that TV show you’ll find it is moderated. Whilst Nine works fine. I’m Andrew from WebHostingHub Support. We are doing Spanish translations of useful plugins in order to ease the people from Hispanic community and we consider that your Better Moderation plugin that we found at http://blog.artesea.co.uk/2011/06/better-moderation.html is very interesting. Would it be ok with you, if I translate it into Spanish? Week ago I have asked for your permission to translate your Better Moderation plugin and I didn’t hear any from you since. I hope that you will find time to provide the reply, because we believe that the translation would be of a great use.